This chapter, however, seeks to move beyond these and explore another biblical theology theme which is rarely discussed, namely, the house of Israel. After outlining and testing the viability of the house of Israel as a biblical theology theme, I offer some concluding thoughts which, together with my closing remarks in Chapter 7, are designed to offer some practical steps to help us approach the Middle East crisis thoughtfully and objectively. In the Old Testament the theme of Israel is so well developed we need hardly dwell on it here. Israel was God’s chosen people, entrusted with a land to reside in and serve Him. Yet though the land certainly helped define Israel, (5) it must be recognised that land ownership is but one dimension of nationhood. After all, biblical Israel survived as a nation during exile and occupation, while for example today, despite the absence of an independent Kurdistan, the Kurds claim nationhood. So while the geographical dimension is important, nationhood comprises much more than this and such was the case for biblical Israel. More important for Israel’s identity was the religious dimension. She was chosen to be in a covenantal relationship with God, a national congregation (6) and a nation of priests (Ex 19:6), unique in history because of her relationship with God (Deut 4:34, 2 Sam 7:23). Israel enjoyed a unique, dynamic relationship with the God of Abraham, Isaac, and Jacob, who loved, guided, instructed, and disciplined her. Not only this, but as Pierre Grelot demonstrates, history is central to the Israelite religious experience. (7) History is a vital dimension of any nation’s self-identity. In Israel’s case, however, history and religious self-consciousness were inextricably intertwined and indivisible, a symbiosis which formed a central defining feature of Israelite national identity. This, in turn, shaped and drove Israel’s cultural identity, which is another important aspect of nationhood. Aside from these religious, historical, cultural, and geographical features, there is also an ethnic dimension to Israelite nationhood. Israel was to be a distinctly Jewish nation. That is not to say, however, this precluded outsiders from joining the house of Israel. (8) God loved and welcomed the alien into the house of Israel (Deut 10:18-19). Aliens were permitted to join Israel, were granted full rights and privileges, and strict instructions were laid down concerning their fair treatment. (9) In fact, in God’s eyes there was to be no difference between the alien and Israelite (Lev 24:22, Num 15:14-16). Several supercessionists have developed a biblical theology theme of alien inclusion to challenge the view that modern Israel remains the people of God. (10) They state that because Israel today mistreats Palestinians, the nation is disobeying the Torah’s commandments concerning alien inclusion and as such she is no longer in covenant with God as His chosen people. Leaving aside how their own leaders and the wider Arab world must shoulder considerable responsibility for the current situation of Palestinians, (11) or how pro-Palestinian Christians taking this position shoot themselves in the foot by unwittingly suggesting the Palestinians are aliens in a land which rightly belongs to Israel, the argument of alien inclusion fails the biblical theology test by virtue of its selectiveness of texts. Indeed, it is undeniable from the Old Testament texts cited that God loved deeply and cared greatly for the aliens within biblical Israel. Crucially, however, this alien inclusion into the house of Israel was a reciprocal, covenantal arrangement, dependent upon various requirements and religious observances by the alien. (12) In short, aliens who joined the congregation of Israel were to leave their people, nation, and religion and become, to all intents and purposes, an Israelite, as so eloquently expressed in those words of Ruth the Moabitess to her mother-in-law Naomi, ‘Your people shall be my people, and your God, my God’ (Ruth 1:16). Thus we see an Old Testament type, or allusion, of a Gentile church being grafted in to Israel, as discussed by Paul in Romans 11:13-24 (cf Eph 2:11-14). Hence, appeals to this aspect of the Mosaic Law to condemn modern Israel’s relationship with the Palestinians ignore the reciprocity element and as such are theologically problematic. The Palestinians are not in a reciprocal covenant – whether religious or political – with Israel today, while the Old Testament is equally clear that where any member of the house of Israel, whether an alien or Jew, not abiding by the covenant was to be excommunicated (Num 15:30). Moreover, such arguments completely ignore how modern Israel’s relations with West Bank and Gaza Arabs differ considerably from those with its 1.4 million or so Israeli Arabs (i.e. Arabs with full Israeli citizenship living within Israel’s nationally recognised borders, as opposed to Palestinian Arabs in what the U.N. regards as occupied territory). By formally accepting citizenship Israeli Arabs have indeed come into a covenant of sorts with modern Israel. (13) Reciprocity is extended in the form of Israeli Arabs being permitted to vote, form political parties, sit in the Knesset, lobby parliament, take their grievances to the Israeli courts and, as the Haredim (Ultra-Orthodox Jews) are exempt from compulsory military service. To be sure, Israel’s relations with its Arab citizens are not perfect. (14) For example, Israel often does not extend the same amount of state funding to Arab compared with Jewish areas, while for their part some Arab Israeli leaders express more loyalty to their own country’s enemies (which has become an electoral issue during the Israeli general election held at the time of writing). Nonetheless, there is a covenant and reciprocity of sorts between Israeli Arabs and the state in a democratic Israel which extends more rights to its Arab citizens than many autocratic Arab states. Clearly, then, the claims by some supercessionists that Israel does not practice alien inclusion fail not only theologically, but also in practice. Getting back to the main point concerning what constitutes nationhood, ethnicity represented an important dimension of Israelite identity and nationhood. Retention of a distinct Jewishness (but not to the point of exclusivity, also allowing aliens to join the national congregation) ensured biblical Israel retained its unique identity. (15) When in the Bible Israel mingled en masse with outsiders, they are condemned because such activity diluted Israel’s religious identity and enticed the nation to serve foreign gods (for example, Ezra 9:2). In summary, then, ancient Israel’s nationhood was defined by a unique relationship with God that shaped its very history, together with a cultural, geographical, and finally, an ethnic dimension (though the outsider who abided by the covenant was also welcomed). Thus, Israel practiced an integrationist rather than a multicultural model. During New Testament times, the nation exhibits these same traits. The Jews still regarded themselves as a nation, (16) as does the apostle Paul. (17) The religious dimension is strongly evident, as is Israel’s ethnicity (Acts 7:19). So despite secularism, atheism, and behaviour from some quarters that blatantly flouts the Mosaic Law, nonetheless much of modern Israel exhibits the features of biblical nationhood. Surely, this zeal for the religion, history, traditions and God of biblical Israel suggests to a degree how we as Christians should view modern Israel, or rather, a large segment of it. Christian Zionists do well to note Israel is a secular country which counts non- (or even anti-) religious elites among its numbers. But within that country is a bloc which demonstrates all the dimensions of the people of God from Old Testament times. This leads us to the second question: what biblical evidence is there to indicate Israel still retains a special and unique place in God’s eyes, both before and after Christ instituted a new covenant? Jesus’ ministry amazed the people (Mt 7:28) and His miracles caused them to glorify the God of Israel (Mt 15:31, Jn 12:13). He told the Syro-Phoenician woman He was sent only to the lost sheep of the house of Israel (Mt 15:24), instructing His disciples to do likewise (Mt 10:5-6). Jesus also expressed great love and tenderness towards Jerusalem (Mt 23:37, Lk 13:34). Meanwhile Yahweh is known as the Lord God of Israel (eg Lk 1:68), Jesus is the consolation of Israel (Lk 2:25), and Simeon refers to Him as the glory of God’s people Israel (Lk 2:32). Given this ministry to and love for Israel it is arguably a hermeneutical stretch always to spiritualise or allegorise the term “Israel”, (20) as well as theologically problematic to dismiss the house of Israel as somehow no longer important to God after many centuries of loving and caring for her prior to New Testament times. More problematic is the suggestion that somehow Israel has been (almost begrudgingly) attached to a Gentile Church, almost as an afterthought, when in fact Paul declares that it was Gentiles who were separated from the commonwealth of Israel and afar from God (Eph 2:12-13), and that God broke off some of the branches of unbelieving Israel so that we, a wild olive, might be grafted in and become partakers of the rich olive tree (Rom 11:17). The root supports the Gentile church, not the other way around (Rom 11:18). That there are apostles to both Jew and Gentile in the book of Acts suggests Israel has not been dispossessed of her heritage. (21) Meanwhile, when the apostles asked the resurrected Jesus if he was about to restore the kingdom to Israel (Acts 1:6), he did not correct them to the effect there would be no such restoration, simply that it was not for them to know the times and epochs. Paul has a great deal to say about Israel. We know at times he observed Israelite religious traditions (Acts 24:17, 26:4). While he states there is no difference between those Jews and Gentiles who are already in Christ Jesus, (22) nonetheless Paul regularly differentiates between Jew and Gentile, whether stating (and demonstrating) that the Gospel is to be taken to the Jew first (eg Rom 1:16), declaring that the Jew will suffer tribulation first (Rom 2:9), and even wishing it were possible for himself to be cut off from Christ for the sake of his Jewish kinsmen (Rom 9:1-3). Romans 9 to 11 is a major passage for consideration. (23) In the first five verses of this text Paul appeals to every one of the religious, historical, cultural, and ethnic dimensions of Israelite nationhood discussed above, and later explicitly refers to the Israelite nation (Rom 10:19). Thus, this passage relates to the election of a nation (expressed through Jacob over Esau, the father of the Edomites) rather than individuals. Paul maintains God has not rejected His people (Rom 11:1), that only unbelieving branches are stripped off to make way for outsiders to be grafted in. So whereas replacement theology claims the Church replaces Israel, the Church in fact is joined to Israel. Paul then warns the transplanted branches not to become arrogant, saying God is quite capable of removing them and re-grafting the old branches. Again, we are back to our discussion of the alien joining and entering into covenant with the house of Israel, such as Ruth, and in this instance, the Gentile church. The thrust of Paul’s entire argument is found at the end of Romans 11, where he discusses how Israel has been used to bring salvation to the world (thus echoing Old Testament passages alluding to universalism ) (24). He explains how salvation, which emanates from Jew to Gentile, will one day return to the Jew (Rom 11:28-36 cf. vs 11-12). Paul even indicates when this will happen: when the ‘fullness of the Gentiles has come in’ (Rom 11:25). At that stage ‘all Israel shall be saved’, (25) a reference to Isaiah 59:20. Interestingly, the very next verse in that Isaiah passage declares God’s covenant with ethnic Israel is forever, while in Romans 11 Paul also goes on to explain how, in the context of Israel, the gifts and callings of God are irrevocable (Rom 11:29). Eschatologically, too, the Bible has much to say about Israel. I am not talking about popular eschatology that seeks to marry prophecy with present world events. Such an approach is often speculative, even sensational, aimed more at selling books than anything else. But in reacting against such extremes, some Evangelicals go too far the other way, throwing out the eschatological baby with the dispensational bathwater. After all, Heilsgechichte (salvation history) covers the whole of human existence, and if the Church has no overriding eschatological hope to draw upon, what is the point? That is not to ignore other core themes brought about and concluded through Christ’s work (whether, for example, redemptive or ecclesiological). Yet as we noted in Soulen’s useful work at the beginning of this paper, the eschatological culmination of the age, including its personal and cosmic ramifications, and the promise of spending eternity with Christ are absolutely vital and central aspects of the Bible’s metanarrative. Eschatology represents the conclusive outworking of salvation history, marking the stage when history ends and eternity begins. Thus the Gospels present the Kingdom of God as realised and eschatological, inaugurated but not yet fulfilled. (27) Even the famous liberal theologian Albert Schweitzer pointed out how Jesus’ message was ultimately and thoroughly eschatological (even if Schweitzer himself believed Jesus was wrong). The house of Israel features strongly in this eschatological scheme. In Romans 11:25-6 (cf Is 59:20-1) Paul declares all Israel shall be saved. That this event occurs ‘after the fullness of the Gentiles has come in’ indicates he has an eschatological event in mind. This juxtaposition of Israel’s eschatological salvation, their washing and cleansing (of sin), and the giving of God’s spirit to His chosen people is a theme taken up in Zechariah’s eschatological discourse (12:10, 13:1 cf Ezekiel 18:31, 36:26-7, see also Isa 44:1-3, Jn 3:5)(28). Zechariah 12, a clearly eschatological passage, speaks of armies congregating upon Jerusalem and Israel for battle, echoing the final battle described in Revelation. The prophet Joel, too, describes such a battle and the very close linguistic similarities between Joel and Revelation 9 is not lost on Bible scholars. So either the author of Revelation merely copies Joel and reports a past prophecy ex eventu, (29) or else both are referring to a future event, a catastrophe to befall Israel. In fact, Joel takes a contemporary catastrophe (the plague of locusts which destroys the land) and projects it far into the eschatological future, detailing not only an invading army’s invasion of Israel, but how through God’s intervention Israel shall be saved physically and spiritually (thus bringing us full circle back to Romans 11:25-6). The central theme in Joel is the ‘day of the Lord’, a well known apocalyptic phrase cited five times in this short book. Yet again this event juxtaposes Israel’s eschatological salvation, her cleansing from sin, and the pouring out of God’s spirit upon her. Granted, Peter draws on Joel 2 to explain the outpouring of God’s spirit in Acts 2. But the apocalyptic scenario set out by Joel (wonders in the sky, blood, fire, smoke, darkness, moon likened to blood) is not present in the manner described in Revelation. As both books are eschatological, the outpouring is likely two-fold, or takes place in two stages: Pentecost and an end-times washing of Israel’s sin and regeneration through God’s Spirit. Immediately before his reference to the outpouring of God’s Spirit, Joel likens spiritual blessing to the Holy Land’s two rainy seasons (the former and latter rain). If Pentecost is the first (an event, incidentally, where all participants and observers were Jews and proselytes to Judaism), God’s eschatological salvation of Israel (‘when they shall look upon him who they have pierced’, Zechariah 12:10) must be the second. Lest one is uncomfortable with the notion of partial, two-fold, or multiple fulfilments of prophecy, the Bible is full of this phenomenon, whether the sign of a maiden with child (Isa 7:14 cf Mt 1:23), God calling His son out of Egypt (Hos 11:1 cf Mt 2:15), or the abomination that makes desolate. This latter example again has an eschatological fulfilment. In intertestamental times Antiochus IV Epiphanes slaughtered a pig to Zeus in the Temple, leading to the Maccabean revolt. Later, Pompey and Titus also defiled the Temple. Yet Jesus also refers to it in an eschatological context. (32) Moreover, if one really desired to be controversial it might be claimed the Dome on the Rock is such an abomination. After all, on the very hill where Abraham prepared to sacrifice his son Isaac (and all the theology that goes with that), and where Jesus’ ancestor David bought the Temple Mount from Ornan the Jebusite, stands a Dome within which is permanently inscribed, ‘The Sonship of Jesus and the Trinity are false’, and ‘It is not fitting that God should beget or father a child’. (33) Such statements put the Danish cartoon protests in a new context, yet of course the Christian way is to turn the other cheek, even when human nature demands retraction of language against our Saviour which we find deeply offensive. Clearly, Jesus supercedes the old covenant, the New Testament shifts its focus away from the land (for now) to a worldwide community of Christian believers, while for the time being the Kingdom has been inaugurated in our hearts. But the salvation story does not end there. The eschatological culmination of the age is a biblical theology theme which is widely represented throughout both Testaments. Another is the house of Israel. Moreover, in the Bible so often both are presented as going hand in hand. Thus, Israel merits closer attention as a biblical theme, not least because Paul says we as a wild olive tree have been grafted into it. Given the strong representation of Israel as a biblical theme, this inevitably has some bearing on how we view the modern state Israel. After all, as noted earlier `Israel’ in the New Testament is nearly always used in an ethnic context. Having offered a biblical theology case for Israel, I want to conclude this chapter by offering briefly a practical Christian response to the current Israeli-Palestinian conflict and the realities on the ground. After all, this is a complex issue which raises many questions for Christians. For example, how do we reconcile our common Judeo-Christian history and values with the situation some Palestinian Christians find themselves in? Conversely, how do we respond to Palestinian liberation theology, given that some Palestinian Christians have come close to understanding (if not condoning) suicide bombings on the basis of Samson’s last act in the temple of Dagon? Moreover, there is a prominent Muslim element in this conflict that demands a Christian response. These are just some of the pressing issues this conflict raises demanding a practical response from Christians. First, in a conflict where every act, word, or nuance is seized upon, it is important to research the history of the conflict and learn the facts. The present conflict did not begin with the First or Second Intifadas, Yom Kippur (1973), or even the 1967 Six-Day War. In the wake of the Holocaust which nearly completely destroyed European Jewry, in 1947 the U.N. agreed a partition plan to create two nations, one Arab, the other Jewish. But we can go further back still, to the Arab-Jewish tensions of 1920s and 1930s British-controlled Palestine (largely fuelled by the Grand Mufti of Jerusalem, a sympathiser of Adolf Hitler), (35) or the British government’s irreconcilable promises made to both the Jewish and Arab populations. In fact, we can go beyond the earliest Zionists in the late nineteenth century and note a sizeable and continuous Jewish presence in the Holy Land since biblical times. Consider also the issue of land ownership. It is easy to reduce the conflict today to one of Israel stealing land. Indeed, the West Bank is presently under occupation (which many Israelis oppose), but much of the land within Israel’s internationally-recognised borders was actually purchased in the early 1900s, sometimes for highly inflated prices. (36) Today Haredi Jews are buying up Arab homes on the Ophel Ridge (the original City of David south of the Temple Mount and overlooking the Kidron Valley) at above-market prices to secure a Jewish presence on a ridge of major historical, political, and religious significance for Jews. Conversely, the Jordanian government is buying up as much land and property as possible to retain its influence in the sensitive Temple Mount vicinity. (37) Thus, beyond the emotive language and propaganda not everything is as it seems. There are realities on the ground that must be understood before we engage in any theological treatment of the conflict, and Christians do well not to rush to judgment or speak hastily without having moved beyond the rhetoric and ascertained the facts (Prov 29:20, Jas 1:19-20). Consider, for example, Ariel Sharon’s plan for withdrawal from Gaza. In light of the intensification of rocket attacks from a recently-unoccupied Gaza on Israeli towns such as Sderot, together with the Palestinian civil war and Hamas’ seizure of Gaza, Sharon’s withdrawal plan was clearly a strategic miscalculation. Also, by returning land for peace Israel has rarely reaped a peace dividend (the return of Sinai to Egypt being a notable exception), with extremism intensifying in Southern Lebanon and Gaza. Yet leaving these political realities aside, the fact remains that in biblical times present-day Gaza covered, in large part, the territory of the Philistines (from where the word `Palestine’ originates). Nonetheless, Christian Zionists vociferously excoriated Ariel Sharon for his Gaza withdrawal precisely on theological grounds. Moreover, as noted earlier, land is but one dimension of nationhood, and just as biblical Israel existed in Babylonian exile, or Persian, Greek, and Roman occupation, so today giving up some land for peace does not dilute Israel’s nationhood (though from a theological perspective it is God’s to give and take away, not Israel’s), even if the present volatile climate makes it politically unrealistic. The fact is, there are realities on the ground that simply cannot be ignored by either side. Israel has no intention of modifying its harsh stance as long as it faces a very real security threat. Neither are the Palestinians going to go away or renounce their claims to statehood. When responding to this issue, pro-Israel and pro-Palestinian Christians have no choice but to confront these realities. Second, if the Bible prohibits false witness, demands justice, and even highlights the importance of measuring with properly calibrated scales (Lev 19:36, Am 8:5, Mic 6:11), then surely even-handedness is an essential biblical principle when exploring this conflict. Thus, our treatment of all the issues must be fair and balanced. For example, though Palestine was a desolate backwater when the first Zionists arrived in the 1880s and 1890s, nonetheless the fact remains it was not an empty land. Though immigration statistics in this regard are notoriously sketchy and unreliable, there is an argument to be made concerning how Zionist economic success encouraged not only an influx of Jews to Palestine in the early twentieth century, but also Arab immigrants from other parts of the Arab world. But once again, the fact remains that the land was not empty when the first Zionists emigrated to the Holy Land, and as both populations grew it was inevitable that one would be pushed to one side. Neither can we justify an “Israel right or wrong” mentality, as some Christians seek to do. Israel sinned even in biblical times, so to ignore her present injustices and sinful behaviour is wrong. There seems little doubt that a gung-ho Israeli military doctrine (which owes something to U.S. military doctrine and methods) has often resulted in what is euphemistically termed `collateral damage’. It is one thing to highlight Israeli actions over security concerns, but quite another to ignore her errors of judgement (or the activities of some “bad apples” within the army, much like troops anywhere else), though we should also differentiate between deliberate harshness and the inevitable Realpolitik Israel practices (which a liberal West no longer has the stomach for). It should be noted that Israeli ruthlessness is born out of very real security needs. Conversely, Israel has faced an existential threat since her inception. Even within hours of declaring statehood she was attacked by various neighbouring Arab nations. Iran’s Mahmoud Ahmadinejad openly and frequently calls for Israel’s annihilation, as do Hamas and Hizbollah. Yet too often, many people (including some pro-Palestinian Christians) insist on exacting a higher standard from Israel than, for example, China, Zimbabwe, the architects of Darfur, and some of the authoritarian Arab nations. After all, Israel is a democratic country which extends more rights to its Arab Israeli citizens than some autocratic Arab countries. Meanwhile many Palestinians are frustrated with their leaders and simply want to get on with their lives. (38) Thus, we do well as Christians to explore this issue objectively and even-handedly, getting beyond the rhetoric to uncover and consider the underlying facts on both sides. This leads to a third point: Christians should set their own agenda for the treatment of this issue, rather than be influenced by the political left, U.S. foreign policy, or propaganda from one side or the other. Listening to some of them, one could be forgiven for almost believing that many Christian Zionists sit in the Knesset, while some pro-Palestinian Christians appear as apologists for Arab nationalism, and even Islam. A minority of Palestinian Christians, too, have arguably been influenced by the Palestinian political agenda, rather than a Christian worldview. Why else do they vocally denounce Israel and highlight their own plight, yet rarely speak out against genuine massacres of Christians in parts of Indonesia, Pakistan, or other Muslim nations? Or why is Palestinian Muslim economic targeting of Christian business, together with physical abuse of Christians in the Palestinian territories by Muslim extremists, ignored? (39) That many Palestinian Christians refuse to embrace liberation theology agenda and denounce Israel, choosing instead to turn the other cheek in the face of Muslim persecution or at-times Israeli heavy-handedness indicates that these Christians, at least, have not permitted outsiders to influence or dictate the agenda. As in the psalmist’s day, Israel today faces an existential threat by enemies who regard her annihilation a religious duty. And unlike the Western mindset, so driven by hedonism and instant gratification, these enemies have a much more long-term outlook and goal. In 2006 I listened to a Hamas spokesman liken the current conflict to the Crusades, declaring that although it took over a century to remove the Crusaders, they succeeded in time, just as they would with the annihilation of Israel one day. Christians clearly must pray for fellow believers living in the Holy Land, so that through their actions and witness both Jews and Arabs might know Christ. Not only that, but if indeed the house of Israel still retains a special place in God’s heart and plans, and as the Middle East conflict shifts from a purely political to a religio-political Islamist conflict that threatens Israel’s very existence, then surely Christians must pray for Israel also. 1. A version of this paper was originally presented to a joint session of the Biblical Theology/Religion, Culture and Communication/Ethics and Social Theology groups on 5 July 2007 during the annual Tyndale Fellowship Study Groups Conference, Cambridge. Several useful comments made during the ensuing discussion are reflected here. This paper also appears in the Evangelical Review of Society and Politics 3.1 (2009). 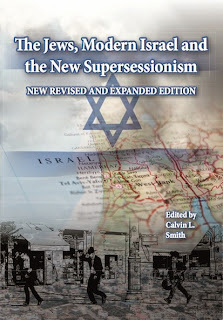 The version reproduced here appeared in The Jews, Modern Israel and the New Supercessionism (2009). 2. For a useful academic treatment of biblical theology, consider Craig Bartholomew, Mary Healy, Karl Moller and Robin Parry, eds. Out of Egypt: Biblical Theology and Biblical Interpretation. Scripture and Hermeneutics Series. Volume 5 (Bletchley: Paternoster, 2004). 3. Grand, central narrative or structure around which the Bible is built. 4. R. Kendall Soulen, The God of Israel and Christian Theology (Minneapolis, MN: Fortress Press, 1996). 5. Indeed, the bequest of the land remains a tenet of Judaism to this day. 6. There are numerous references and allusions to the `congregation of Israel’ in the Old Testament. 7. Pierre Grelot, The Language of Symbolism: Biblical Theology, Semantics, and Exegesis (Peabody, MA: Hendrickson, 2006), 103ff. 8. As Matthew’s genealogy notes, aliens such as Tamar, Rahab, and Ruth became not only full participant members of the congregation of Israel, but they are also listed as direct ancestors of the Jewish Messiah. 9. Consider Lev 23:22, Num 35:15, Deut 10:19, 14:29, 24:17, 24:19-21, 26:13, 27:19, Ezek 22:7 and Jer 7:6. 10. See Gary Burge, Whose Land? Whose Promise? What Christians Are Not Being Told About Israel and the Palestinians (Cleveland, Ohio: Pilgrim Press, 2003), 88-93, and Colin Chapman, Whose Promised Land? (Oxford: Lion, 1983, 2002), 204ff. 11. This issue has been discussed widely in the ongoing debate surrounding the Middle East crisis. For an example of a recent newspaper article exploring the issue, see Catherine Philp, ‘Palestinians dumped by road in no-man’s land, ignored by all’ in The Times (6 February 2009). The article is also available online at www.timesonline.co.uk/tol/news/world/iraq/article5671797.ece (last accessed 9 February 2009). 12. For example, the alien was expected to observe certain religious and other laws (Ex 12:19, Lev 16:29, 17:12, 17:15, 18:26, 24:16, Num 19:10, Deut 26:11, 31:12, Ezek 47:23). Moreover, if he was to become a member of the congregation and participate in the Passover feast (a key aspect of being an Israelite), he was to be circumcised (Ex 12:48-49, Num 9:14). Certain religious observances were expected not just from the alien, but also the sojourner (Ex 12:45, 20:10, Deut 5:1). 13. Recently, however, some Israeli Arab leaders have become increasingly vocal in their denunciation of the Jewish state. This has lead one right-wing Israeli politician, Avigdor Lieberman, during the general election held at the time of writing, to call for the introduction of an oath of allegiance, with citizenship being stripped from those who refuse (for example, see Damien McElroy and Dina Kraft, ‘Former nightclub bouncer Lieberman set to hold balance of power after Israeli elections’ in The Daily Telegraph (27 January 2008), online edition: www.telegraph.co.uk/news/worldnews/middleeast/israel/4347827/Former-nightclub-bouncer-Lieberman-set-to-hold-balance-of-power-after-Israeli-elections.html , last accessed 9 February 2009). 14. That is not to say all these rights are necessarily always exercised unfettered, though Israeli Arabs arguably face problems because some reject the legitimacy of their own state. 15. Several supercessionists argue that a Jewish state is by its very nature racist, thus rendering modern Israel theologically in error. Yet today (much like in Old Testament times) Israel’s Law of Return permits Jewish proselytes (i.e. not ethnically Jewish) to make aliyah (emigrate to Israel). Moreover, citizenship is automatically extended to non-Jewish spouses, children, and grandchildren, while the inclusion of Ethiopian and Yemenite Jews demonstrates that Jewishness moves beyond ethnicity and Israel is far from racist. For details of the Law of Return see the document posted on the Jewish Agency for Israel website at www.jewishagency.org/JewishAgency/English/Aliyah/Aliyah+Info/The+Law+of+Return/The+Law+of++Return.htm (accessed 16 July 2007). 16. For example, Lk 7:5, 23:2, Jn 11:48, 50, Acts 10:22. 17. Acts 24:2, 17, 26:4, 28:19. 18. Religious schools for the study of the Torah and Talmud. 19. As does Israeli Arab demography, much like the higher Catholic birth rates compared with those of the Protestant community in Northern Ireland. 20. Arguably, the word “Israel” in the New Testament (with the oft cited exception of the reference to Israel in Rom 9:6, and the ‘the Israel of God’ in Gal 6:16 cf the false Judaisers, but see Andy Cheung’s comprehensive discussion in Chapter 1) always denotes an ethnic entity. Surely, then, the onus is on those who believe so to demonstrate how the New Testament use of the word “Israel” has shifted from an ethnic to an allegorised definition, rather than the other way around. 21. Pierre Grelot makes a similar point in Language of Symbolism, 142. 22. See Rom 10:12, 1 Cor 12:13, Gal 3:28, and Col 3:11. 23. Rom 9:1–5 clearly indicates Paul is referring to ethnic, rather than a spiritualised Israel here, and even Colin Chapman accepts that most of this passage relates to the Jewish people (Whose Promised Land? 245). 24. i.e. the opposite of particularism, rather than that theological concept of universalism which holds to the view that everyone shall be saved. 25. Verse 26. See also Acts 13:23. 26. Without doubt hermeneutics is crucial to this debate, with pro-Palestinian Evangelicals drawing strongly on an allegorical approach (for example, Chapman cites Philo of Alexandria during his discussion of the land, 142-3), and pro-Israel Christian Zionists favouring a strongly literal interpretation. Without due care and hermeneutical consistency such a reading of Scripture can become overly literal (for example, the New Jerusalem of Rev 21:2 means so much more than the restoration of the earthly city of Jerusalem), yet conversely supercessionists must take care not simply to go the other way to defend an a priori view of what constitutes Israel in the New Testament. 27. The debate among biblical scholars concerning the timing of the kingdom is well known. Passages which clearly portray the eschatological aspect of the Kingdom of God include Mt 13:47-50, 25:1 (during Jesus’ eschatological discourse), Lk 22:16-18, Rev 11:15, 12:10. 28. The “heart of stone” detailed in Ezekiel is likely an allusion to the tablets of stone that contained the Law, symbols of the old covenant replaced with a new covenant with the house of Israel (cf Jer 31:31-37) at the time of her eschatological salvation. Another passage worth considering here, apparently in an eschatological context, is Zech 8:23. 29. Literally, “after the event”, whereby a writer describes a prophetic event after it has taken place but maintaining it is yet to come. Those arguing for this device often do so because they deny the concept of predictive prophecy. 30. Mt 2:2, 27:11, Jn 1:49, 12:13. 31. Bearing in mind Paul’s reference to the ‘full number of the Gentiles’ coming in, Lk 21:24 echoes a similar phrase in an eschatological context, at which time the land again takes centre stage and comes back under Jewish control. The question is, are we are in those last days now? If so, then the establishment of modern day Israel indeed looks very much part of the divine plan. But if the end times are not yet upon us, it is equally possible to hold to the view of the Jews as God’s chosen people and their eschatological restoration, without having to state dogmatically the establishment of modern Israel is divinely ordained. 32. In fact, much like Joel, Jesus’ great eschatological discourse in Matthew 24-5 takes a (near) contemporary event (the fall of Jerusalem in AD 70) and projects it into the eschatological future to describe a catastrophe to befall the Jewish people (Mt 24:16-20). It is immediately after these events that Jesus describes the glorious return of the Son of Man (24:29-31). 33. Moshe Sharon, `Islam on the Temple Mount’ in Biblical Archaeological Review 32.4 (July-August 2006), 42, 45. 34. A point discussed by Stephen Sizer in Christian Zionism: Road-map to Armageddon? (Leicester: IVP, 2004). It is unfortunate Sizer takes an unnecessarily polemical and sensational stance, as well as his tendency to parody pro-Israel believers as extreme Christian Zionists, as any useful point such as this he makes is lost on a wider audience which rejects both his pejorative language and lack of objectivity. 35. Martin Gilbert discusses at length the role the Grand Mufti in Jerusalem in the Twentieth Century (London: Pimlico, 1996). 36. For example, see Martin Gilbert, The Routledge Atlas of the Arab-Israeli Conflict (London: Routledge, 2002), 12. Colin Chapman also discusses in some detail how early Zionists purchased land from absentee Arab landlords (Whose Promised Land? 59-61). 37. Aaron Klein, `Jordan secretly buying land accessing Temple Mount’, World Net Daily (3 July 2007). www.worldnetdaily.com/news/article.asp?ARTICLE_ID=56483 (last accessed 14 July 2007). 38. Several years ago an Arab Jerusalemite taxi driver I chatted with brought up the issue of Israeli Prime Minister Ehud Barak’s substantial peace offer. He was at a loss to understand why Yasser Arafat had turned it down, going on to express resentment against Palestinian leaders for not making peace with the Israelis so that everyone in the region could get on with improving their lives and economic wellbeing. I have heard such sentiment echoed several times among everyday Palestinians. 39. For a discussion, see Daniel Pipes, ‘Disappearing Christians in the Middle East’, Middle East Quarterly (Winter 2001). The entire issue of this journal, which is devoted to Christianity in the Middle East, is available online at www.meforum.org/meq/issues/200101 . See also Elizabeth Day, ‘O Muslim Town of Bethlehem’, Daily Mail, 16 December 2006, and Tim Butcher, ‘Why Bethlehem’s Christians Are Still Voting With Their Feet’, Daily Telegraph, 20 December 2006. 40. Mt 23:37, Lk 13:34. Interesting piece, Calvin. A few quick questions, though. When yu talk about biblical theology, do you differentiate it from systematic theology? You discuss themes and so on, which seems a bit like a systematic method. Isn't the Mosaic covenant different from God's other covenants (eg, Adamic, Abrahamic, new covenant) insofar as it is conditional? Doesn't this mean that the Israel (as a people) must obey God's commands in order to claim their covenant rights? Do you believe that there are multiple covenants? If so, which are still valid today? I broadly agree with you on the Romans analysis, though I don't believe it implies support for a state of Israel in any way.